Sorry to anyone who is seeing this twice, the original post got lost due to some server issues so I’ve had to re-publish it. So at the beginning of last month we were guests at ConCarolinas. Great time and we’ll definitely have to go again next year. Besides the various panels me and James talked on we also showcased a board game we’ve made currently tentatively titled Hexit Strategy. The second day of the convention we got several people to play our little game and even had three games going at once! So right now we are looking at few things to do next. Looking at thegamecrafter.com or some other source to make a printing of the game. Working on making a digital version of the game. Re-write the rules so they are easier to understand without someone who knows the game explaining them. That last one I discovered when I had the guy from Bower’s Game Corner review it from our Print & Play pdf. The digital version has been a little bit slow in part because of exhaustion from the convention and also a bit of craziness going on in personal life. I’m going to be trying to get back to it now though and regularly make progress, update you all here, or ideally both. On another note if anyone of you out there are good with user interface design, especially if you’ve used Unity3d and NGUI before and would be interested in helping out with Fortunes, please let me know. What are your favorite conventions? Where should we be going to try and show off/drum up interest in our games either board or video? Let us know in the comments! Fortunes work has taken an upswing lately. Regular feedback is a huge help and I’ve been lucky enough to have made a friend who is willing to do a pretty good job of giving consistent feedback and poke me about making fortunes updates. I’ve done a bit of restructuring of the user interface to try and make things like what team you’re on and which score corresponds to which team more obvious(the fact that things like this aren’t apparent are things you lose sight of when you know the game in and out and have been working on it for a long time.) Still need a way to make the different suits of cards clearer but that may have to be up to the final art to convey. Still would be good to be able to convey this somehow other then relying on the art though. 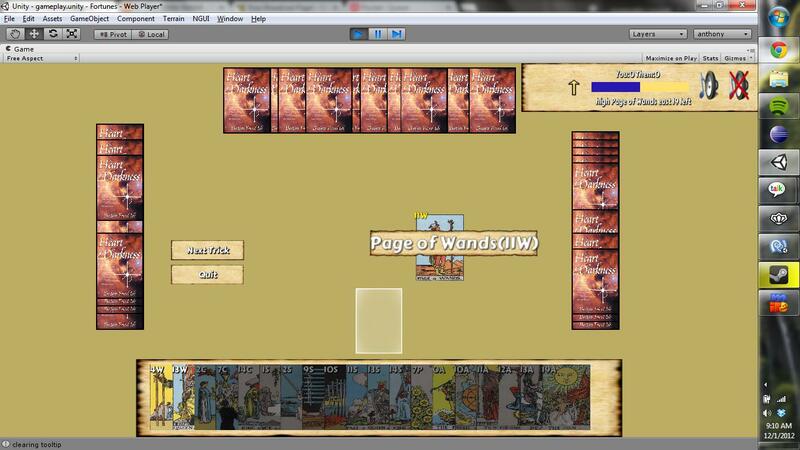 Also added a score summary at the end of hand before the divination screen to give a clearer picture of how you fared. If you want to see how Fortunes is in its current state, go ahead an go play fortunes. Today, I’m excited to share an overview of my experience with MMOs (Massively Multi-Player Online Games). I didn’t grow up in or around the video game industry, or around video game players. I know how it feels to wonder why our friends, family, and loved ones seem “glued” to their electronics. And that’s part of the reason I’m so passionate to share all that I’ve discovered in the video game industry. It is not simply a set of pixels your children, spouses, or friends are staring at when they play games. It’s actually a whole spectrum of invention, discovery and ingenuity. Players are discovering artwork, storylines, history, skill sets, challenges, and collaborating with others on a planetary scale. But beyond all of these discoveries, MMO players are also learning and absorbing life skills and benefits that can translate into our daily lives outside the game. How so? Let’s take a look! The last time I heard my girlfriends say that video games are anti-social, I had to ask them to explain. One response: “Well, if you sit in your room playing video games, you’re not going out and meeting new people.” In that moment I knew I had to offer my two cents on the subject, because I’ve discovered the opposite. When we play video games like MMOs, we are constantly meeting new people, and not just in our neighborhoods, but we are meeting new people from all over the world. Video games are one of the most interactive and social forms of entertainment we have available. Another listener then said, “Well, video games make you look like an unsociable weirdo.” Again I had to give a rebuttal. Video games offer a way for us to become social heroes. Fictional characters like batman and superman don’t have to be left on the comic book page anymore, they can be extended through digital art, and allow players to live the experience. Through video games, players get to save lives, restore trust, and help the public stand up against criminals. Would it be better to spend all your free time at a bar or watching television? Both of those have their pros and cons, too, but video games stand apart as a unique alternative: Instead of taking in empty calories, or watching television programs that imply you’re not good enough and you’ll lose, games teach us that we’re epic and we’ll win. Through games we learn the habits of heroes—our batteries get jumpstarted. The next time you get the opportunity to play a video game, remember this is your chance to be super-social and heroic! What’s wonderful about MMOs is that they force players to be the opposite of lazy. When we play collaborative video games like MMOs we are learning an array of new information about art, technology, programming, entertainment, and community. And at the same time we are constantly challenged to solve problems, create strategies, and formulate plans to protect our team. These experiences open up skill sets for building camaraderie and teamwork that in turn can make us more proactive in both our professional and social circles. And to touch on a more technical and scientific aspect, brain scientists like Daphne Bavelier continue to discuss the power of video games and how much they improve our cognitive functions making us smarter human beings. Communication improves when playing MMOs, as well as our ability to adapt, and make quick decisions. These multi-player games constantly challenge players, which improves awareness and cognitive responses simultaneously, and can also open up opportunities for players to utilize these unique skills outside of game-play, too! I found that after playing MMOs I was even more of an active listener. While playing an MMO, it is paramount that you maintain eagle-eye awareness and that you are always ready to help your team. What a great avenue to evolve and perfect our social skills! Building self-esteem or maintaining a sense of confidence can be difficult. Self-doubt is one of the most profound and detrimental human struggles. Thankfully, MMOs open the door for players to build confidence. When you turn on your game, you are the hero. By surrounding ourselves with positive affirmations, we are going to feel better. And when we feel better, our positive attitude will translate into positive behavior in both our professional and personal lives. Storylines in video games empower us to believe in ourselves and constantly reaffirm our importance in the mission. As players, we will often hear statements like, “We couldn’t have won without you,” “Good work!” “Thank you so much,” and “You saved us!” MMOs offer crucial validation and give players the means to enhance their lives. Every once in awhile we all get that overworked, overtired, and underpaid feeling. Impossible demands take their toll. Students face peer pressure in school. Professionals starve for feedback in the workplace, and at home, stress feeds negativity. It is easy to blame the things around us when life gets hectic. But hobbies like playing MMOs are often not the cause of stress but the reliever of it. It might be easy to observe someone playing a video game and misinterpret that action as apathy. However, it’s important to remember that all humans need time to unwind, because when we relax our minds have the chance to process our daily stress and to rejuvenate. Video games offer relaxing entertainment that can help reduce stress. They offer a way to explore, create, and imagine—which is not something adults get to do that often. I imagine we all have relatives who wonder, “Are video games a waste of time?” “Why does my spouse play video games in to the night?” “Why does my child want to play a video game instead of go outside and play?” “What’s got into him or her?” I ventured into the world of MMO gaming as an adult and discovered a passion for in-game community, especially in raiding teams. Working with industry professionals, I gained a deep understanding of video games and their artists, lore, culture, and development, and that’s how the story for The Holder’s Dominion was born. I wanted to write a novel for gamers and non-gamers alike about the unpredictable and influential ways that video games change us, and to share with others the amazing experience of collaborative video games and the communities that grow up in and around them. And on March 1st, 2013, The Holder’s Dominion was published! This fast-paced story aims to bridge the gap between families and friends of gamers who wonder about the allure behind their loved ones’ fascination with video games. The Holder’s Dominion has the potential for readers to understand why people, young and old, want to play video games. The inspiration behind writing it came from wanting to create a basis for family and friends of gamers to understand them and their world. Because this book was constructed as a gateway for fans lacking deep exposure to the genre, the novel begins its exploration from the perspective of an inexperienced gamer. The next time you see someone playing an MMO, or talking about “Raid Night,” try to see that person through a new viewfinder. Multi-player games are a wonderful way to connect with others. In the right balance video games enhance and benefit our lives. The Holder’s Dominion reveals online gaming in an easy-to-follow and riveting setting, revealing the secret side to online games, and an avenue for different generations to understand one another. As a speculative thriller, this novel is changing the perception of video games and video game players worldwide! We are preparing to ramp things back up here at Cliche. James has been super bogged down with his day job and I’ve been dealing with moving to a new city and getting settled in. We’ve got a lot going on this spring. Cliche Studio is going to North Carolina May 31-June 2 for con carolinas. We don’t know what panels we’ll be on yet but in the afternoon-evenings we will be showing off two games. Hexit Strategy and Fortunes. 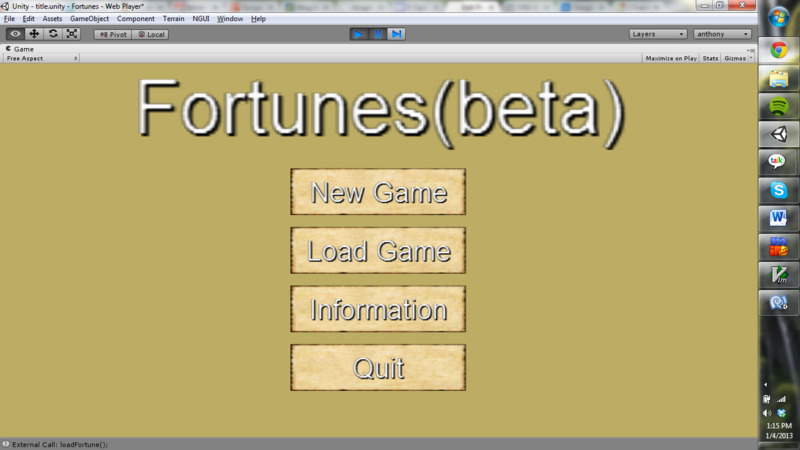 Fortunes UI work has resumed and we have offloaded hosting of the work in progress to gamejolt. Their site gives me more flexibility with the presentation of the game without me having to be concerned about breaking the theme of the current website or muck around too much with wordpress settings. If you want to see how the game has progressed head over there, play fortunes, and leave a rating or a comment with some feedback. James has done a good bit of playtesting with our newest version of Hexit Strategy, and our friend Corey has been working on some art as you see above. We hope to have 3 sets of the game ready for the convention. I also discovered a nifty site called gumroad which lets us put up the print and play version for sale and handles everything for us. It is a pretty nifty set-up and we have the pdf as pay-what-you-want. We’ll be sure to make an updated version once all the artwork is done. In the meantime go download and play. Sidenote: To break-up the long slog through this lengthy project of fortunes and to hone my own personal skills I’ve been participating in one game a month. Some of these are not official cliche games but you can check out else I’ve been working on here. Not the most legible font. 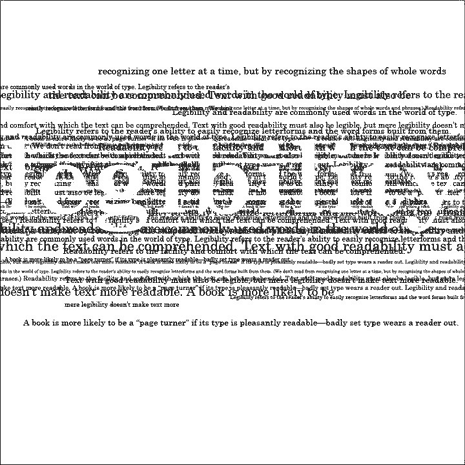 I’ve been on a bit of a break due to moving to Philadelphia and the holidays but one major thing I am looking at as I get back to work on both fortunes and the side task of one game a month is legibility. The default NGUI fantasy font did not work terribly well from the web demo of fortunes. Fortunately I was easily able to import another font with it and BMFont. The only difficult part was realizing I needed to change the extension of the text file BMFont created from .fnt to .txt to get unity/NGUI to be able to read it properly. Also important is to backup your project before making changes to the atlas. I got some strange results when Unity crashed mid-way through the process. I have some metrics issues which are preventing me from getting to one of the larger screens of text to show a better example of the new font. But once that is all resolved and bug tested I will get a new version of the game up here which will hopefully be at least 30% more readable and therefore 50% more fun. Do you have any suggestions on how to make leaving feedback on the game easier? Please let me know! So a big advantage of this big UI overhaul is that I have actually visible things to share today! So there are a couple of things going on here. The entire information section at the top has been shoved over to the right and made more graphical. While the card hands of other players are now visible to give a better sense of what is going on around you. I’ve also added some animations to playing the cards and a visual measure of how you’re doing. So things have been slow lately with the holidays disrupting schedules and James’ ungodly amount of work from his dayjob, but we are chugging along. I have been working faithfully on the UI of fortunes because apparently people couldn’t figure out what to do. That was quite embarrassing. Got a lot of feedback from the feedback Friday posts over on Reddit and done a lot to shape things up. Only thing is there has been a resolution error between the Unity editor and the web player, and apparently what I thought was the visible area was in fact larger then what actually gets shown. So in the future I need to separate my build folder from what gets shown here on the website. Unless you all enjoy seeing my mistakes. Oddly enough even in full screen it just shows the same partial portion of the screen. That is the name we are thinking of for the hexagon game we’ve mentioned recently. Thanks go to my friend Sam for the name suggestion. We are editing a pdf for a print and play version with the current rules and then will be working on a variant based on our recent playtesting and feedback from Sam and we can see what works better and what people like more. Hopefully we’ll be getting a press cutter sometime next year and be able to make a copy of the game with actually symmetrical pieces instead of the uneven cardboard coasters we’ve cut ourselves. Not a whole lot visual changing dramatically at this point, but we are trying to get things tested and changed with fortunes. So I’d like to ask you to give it a shot and leave some feedback in the comments here, there, or to lathomas@clichegames.com. How intuitive is the interface? How long did it take you to figure out what to do? Did any actions have unexpected results? If yes what did you expect and what actually happened? Cards should be greyed out and have white labels while its not your turn. On your turn the labels should turn red if they aren’t playable or yellow if you can. Occasionally the labels stay white and the playable cards remain greyed out. At this point the game must be refreshed but I’m trying to find the cause of this.